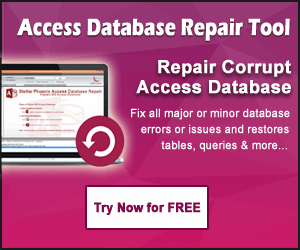 Summary: In my last post I have discussed about 5 Easy Solutions To Repair Corrupt MS Access 2007 Database and now in this post I am going to discuss about how to repair MS Access database (.accdb) file using Compact and repair utility (manual method) as well as well as by using Access Repair and Recovery Tool (automatic method). Just like any other computer files, MS Access Database files are also not able to protect themselves from corruptions, damage and errors. No matter how much we try to avoid the corruptions, but still MS Access 2016 database (.accdb) files gets damaged/corrupted. 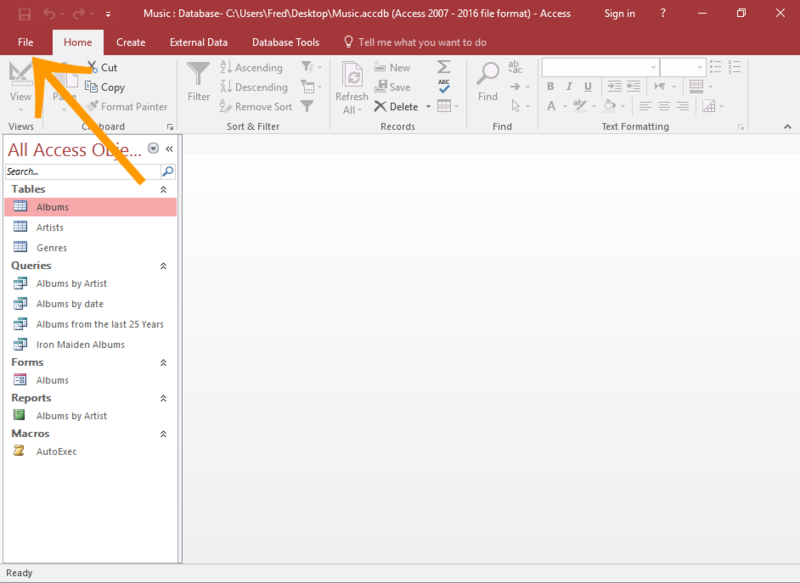 How MS Access 2016 (.accdb) Database Files Gets Corrupted? There could be several reasons behind the damage or corruption of Access database files. As days passes by the Access database files keep on accumulating data and hence the size of the files grows quickly. Due to this the ACCDB file crosses its storage limitation and hence the corruption occurs in MS Access 2016 .ACCDB files. Other reasons could be virus infection, improper exist of applications, interruption to the Access database file, etc. Fortunately, Microsoft offer compact and repair utility that can be used to fix any initial damage or corruption of MS Access database files. Why We Should Use “Compact & Repair” Utility? This inbuilt utility helps to fix the problems and corruptions that affect to the functionality of database. When you add or update data or change its design, a database files become larger in volume and size. The growth in file size takes place due to addition of new data but some of them also come from other sources. Access application creates temporary and hidden objects to perform various tasks. These temporary & hidden files still remain your database even when Access does not need them. When you delete any object from the database, the emptied space is not occupied by any other items. Access still occupies the disk space even after the object is deleted. 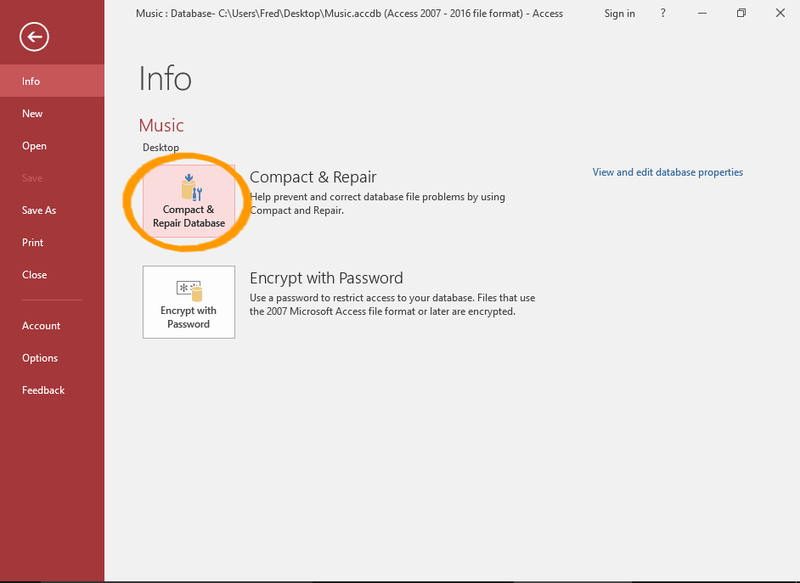 How to Repair MS Access Database when “the compact and repair operation has been cancelled” error occur? As your database is filled with temporary and deleted objects, it is obvious that its performance will decrease. You may notice that your database opens up slowly, queries taking longer time than normal as well as other operations are taking longer time to execute. Note: When you compact database, it does not compress your data, it simply removes the unwanted files and unused space and thereby makes your database file smaller. As mentioned above that ACCDB files are prone to corruption. If you are frequently adding or editing the data in memo field the risk of corruption is high. If database files are shared over the network and multiple users are accessing the same files, then there are risks of database to get corrupt, but the risk is low. As a matter of fact, such type of corruption occurs due to problems with Visual Basic for Applications (VBA) module that does not pose a risk of data loss. However, it poses the risk of damage in the database design such as unusable forms or lost VBA codes. You must take a note that database file corruption rarely result any data loss. 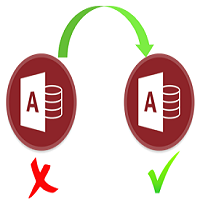 Tip: If you split and keep the databases separate that users do not have direct access, then it helps in preventing the corruption. Note: Before you start with process, it is suggested that you must keep the backup of your database files that you are going to compact and repair. Step 1: Open Access, but do not open database. Click on File. Step 2: Point the cursor to Info and then click on Compact and Repair Database. Step 3: Now in the Database to Compact From dialog box, browse and select the database that you want to compact and repair. Note: Make sure that nobody is using the database file, or else the compact and repair utility will fail. 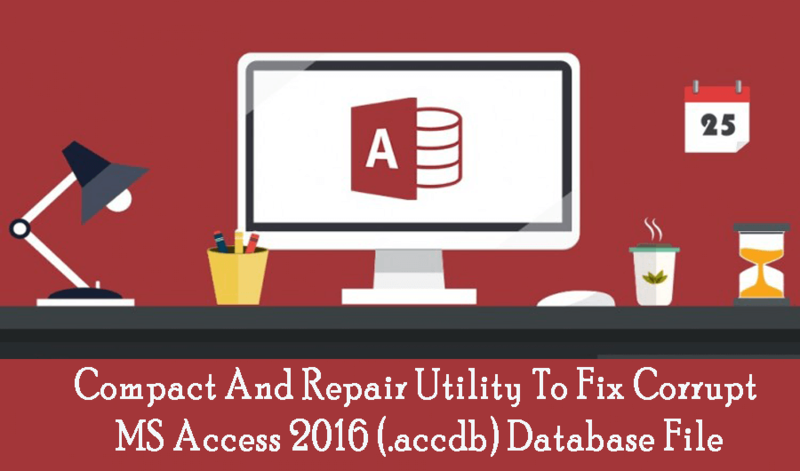 What To Do When “Compact & Repair” Fails To Fix MS Access 2016 (.accdb) Database Files? 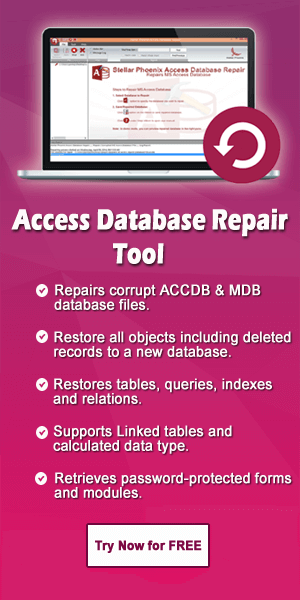 When built-in “Compact & Repair” utility fails then you can use professional third party Access Repair and Recovery Tool that is designed to fix, repair and recover all version of Microsoft Access database such as 2016, 2013, 2010, 2007, 2003, 2000, etc and repair both Access (.mdb & .accdb) database file format. Step 1 – Download and install the MS Access Database Repair software. After installing, select the corrupt Access file for repairing by clicking on “Select file”. Step 2: This software will give you the list of all searched file in a drive. Select the file you want to repair and click on “Repair” button. Step 3: The repairing process will start as you see in the image below and you can see the log report for detailed analysis. Step 4: Once the repairing process completes, click on “OK” button to see the preview of the database objects. Step 5: You can now see the preview of the repaired file. Step 6: The tool will save repaired database by default to the location where the corrupted database was saved but it will rename the file. However, you can select your own desired location to save repaired database. Step 7: Once you select the desired location you can then see that saving is under process. Step 8: Finally, saving completed. Whenever users face any corruption in MS Access Database files, it is always suggested that you must perform “Compact & Repair” which is a powerful utility offered by Microsoft. However, when “Compact & Repair” utility fails and if you do not have any other option available to restore your database files, then it Access Repair and Recovery Tool is strongly recommended.